Sketch ~N~ Scrap: A winner and December's featured scrapper! A winner and December's featured scrapper! Congrats to Tiffany! Enjoy your new washi tape! Email me your address at Sketchnscrap@gmail.com to claim your prize. I know you ladies will put your new scrappy goodies to good use on one of our January challenges! Can't wait to see what you create! Now on to our Featured scrapper for the month of December. Congrats to Kirsty! We loved all the fine details that went into her layout using our December bonus sketch! 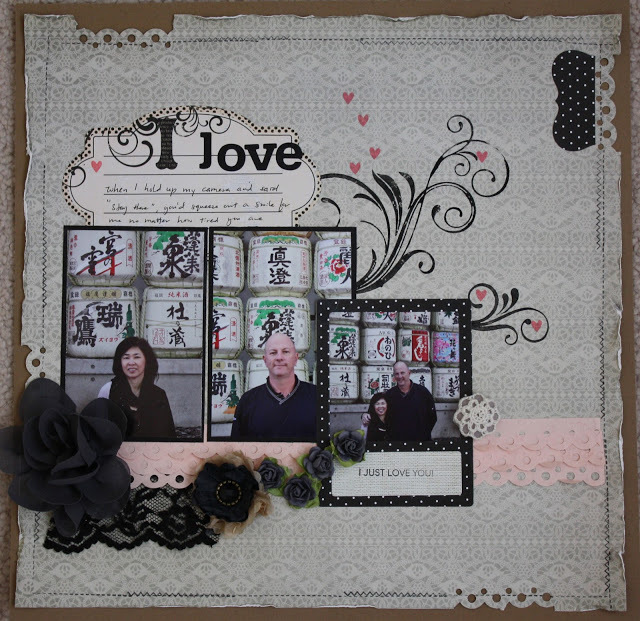 From the distressed edges, to the lace and flowers her layout was a real eye catcher! I hope you will visit her blog and leave her some love, she has some beautiful artwork showcased there, I enjoyed my visit and know you will too! Each month we will feature one scrapbooker who submits an entry to one of our sketches that really catchs the DT's eye. All featured scrappers will be showcased on our sidebar for one month and they will get to grab our featured scrapper button to display on their blogs. Thanks again to all who participated in our monthly challenges! We love our followers! Hope you will find time to join in the fun this month! Remember you have until January 31st to link up! Congrats to the winners and thanks for the showcase, I had fun playing with those wonderful sketches this month, I wasn't comfortable with multi-photo layout before this, thanks for the opportunity to let me try out something new, thanks for the fun too! Congrats to all of the winners, you ladies rock!!!! Congrats everyone! How exciting!! Off to work on the next challenge! Our First Ever Blog Hop!